On April 9, 2017 it will be 100 years since the historic assault by the Canadian Expeditionary Force (CEF) on the Vimy Ridge, near Arras France. This attack by the CEF has been attributed to Canada’s “Birth of a Nation”, as it catapulted Canada into a class of battle hardened countries that saw men, women and children all working as a team in support of the boys at war. At the time, the assault was also significant as it was the first time that all four (4) Divisions of the Canadian Corps fought side-by-side in one event, at the same time. The CEF served as a Corp of the British Army, and the taking of Vimy Ridge was a parallel assault historically referred to as the First Battle of the Scarpe. My grandfather, George Van Wyck Laughton M.C., served as a Canadian seconded to the British 3rd Army as a 2nd Lieutenant in the 26th Northumberland Fusiliers. He led his platoon, and survived the war, on the right flank of the Canadian Corps on April 9, 1917. His service inspired my research into Canadians in the Great War. The Commonwealth War Graves Commission (CWGC) reports that 3,279 Canadian men paid the ultimate sacrifice during the four (4) days that are directly attributed to the assault on Vimy Ridge from the commencement of the action at 5:30 am on a snowy Easter Monday, until the final capture of Pimple by the Canadian 4th Division of April 12, 1917. A total of 13,684 Commonwealth Soldiers were lost in all actions during this same 4 day period in the Great War of 1914-1921. There were a staggering 1,010 Canadian men who were lost in this period that have no known grave and are thus enshrined on the Vimy Memorial. Privates Baguley and Tremblett have no known grave and are thus named on the Vimy Memorial. We know that Baguley was buried in CA40 so there is a chance that we may be able to find him in the next few years. Private Tremblett has no burial record, as anything after SIMMS was lost in the London Bombings of WWII. Private Eden is buried in a mass grave in the Lichfield Crater, one of the only two crater burial sites at Vimy. Private Graham is buried at the Nine Elms Military Cemetery, one of the major cemeteries for the action at Vimy Ridge. We may find that Private Baguley is also buried in Nine Elms, as we have strong evidence that the men from CA40 were buried there but the records were lost. We know that Private Baguley was killed later in the day on April 9, 1917 as he was in the vicinity of Farbus Woods, well past the jump-off locations near Neuville St.Vaast and the intermediary positions near Thelus. He was a Private in the 16th Canadian Infantry Battalion, 3rd Infantry Brigade, 1st Canadian Division. Private Albert Eden was serving with the 21st Battalion, 4th Infantry Brigade, 2nd Canadian Division. 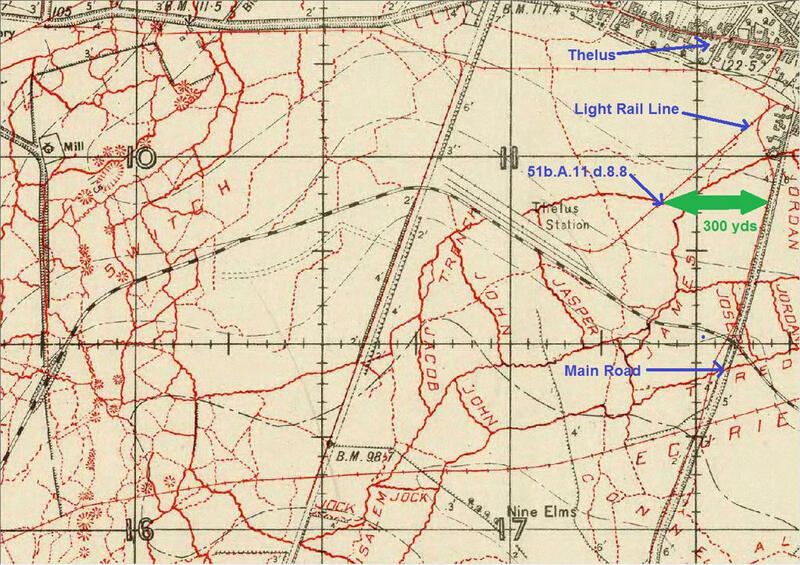 They were on the north (left) flank of the 16th Battalion, north of Thelus, also heading towards Farbus. We do not know the location or time that Private Eden was lost, but it we can speculate it was early in the action, as he is buried in a mass grave at the Lichfield Crater near where the battle started at Neuville St.Vaast. Private William Graham, also of the 21st Battalion, is the only other of the four Milton men to have a known grave. He is buried in the Nine Elms Military Cemetery, south of Thelus, after he was exhumed from a battlefield grave just south of Thelus. From this we know that he fell mid-day on April 9, 1917. As noted previously, we have no details on Private Tremblett, other than that he also served with the 21st Battalion. During the period from December 23, 2014 to March 7, 2017 I have been searching for the graves of Canadian men, plus a few other Commonwealth soldiers and airmen, who were reported to have no known grave and were thus named on one of the Memorials for the Unknown (Vimy Memorial, Menin Gate, Arras Flying Services Memorial, Halifax Memorial). More than 100 cases have been examined to date, of which 77 have a good chance of being located. To date, 58 Canadian cases and 5 other Commonwealth cases have been submitted to the CWGC for a change in commemoration – the process of changing the headstone of an unknown soldier to that of an identified soldier. Extensive research is completed on each case, matching to location of the battalion, the details of the loss of the soldier, and the clues provided by the exhumation reports, war diaries and possible candidates for the dead. Private Baguley may perhaps be one of those that are to be found, but his case has not advanced to that level as of this date. Thousands of hours have been spent searching for these men, we will find them! The fate of Private Baguley came to the forefront of our research in March 2015 after the video by noted Military Historian Norm Christie (battlefields.ca) appeared on public television. The show, known then at The Missing told the story of 44 men who were known to have been buried during the action at Vimy Ridge in a battlefield grave site identified as CA40 (C = Canadian, A = 1st Canadian Division, 40 = burial site). The CWGC reported that the CA40 cemetery was 274 metres west of the main road by the light railway track near Thelus, France. It was further reported that the men in this battlefield cemetery were later concentrated into the Nine Elms Military Cemetery, a short distance to the south. It is here that Private William Graham of Milton is also buried. Norm Christie proposed that the 44 men (really 40 men, as 4 were found) had not been exhumed and were still buried in a field, the site of a battlefield crater, southeast of Neuville St. Vaast. In the video, he tells us that this must be, as the men were not found in the Nine Elms Military Cemetery. Initially this was a believable story, and I undertook to assist by initiating a fund raising campaign in Milton to support the $100,000 Christie objective to find the 40 missing men. 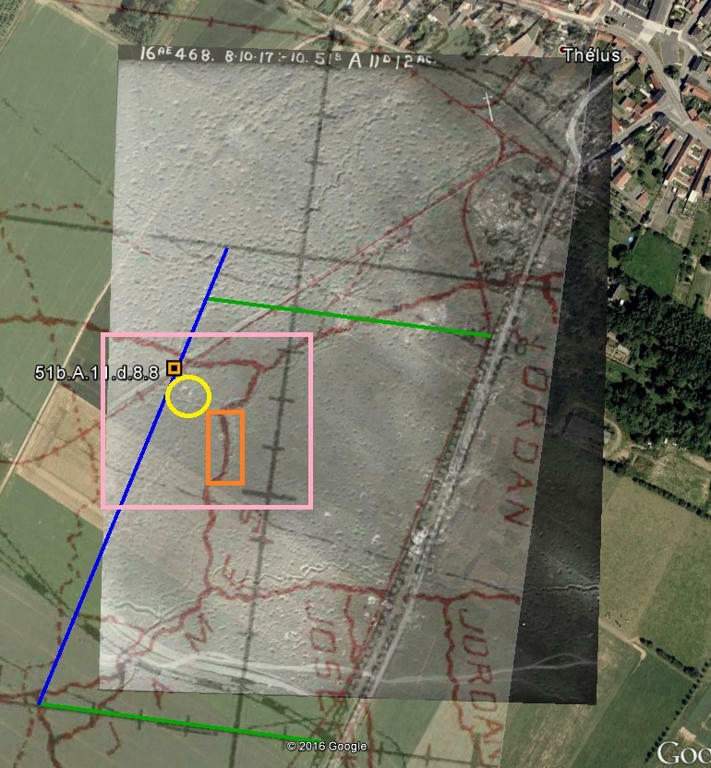 A short time later, the Norm Christie hypothesis began to fall apart – terribly, and a year later on March 1, 2016 our research group reported to the CWGC that the location of CA40 was not where it was proposed in the video, but precisely where the CWGC reported that it was located. Over two (2) years of research have now gone into the investigation of the location of the supposedly lost men of CA40 and it now appears that the most logical (obvious) case was that the men were exhumed and concentrated into Nine Elms Military Cemetery, exactly as stated in the historical CWGC reports. The Christie case was misleading, for most certainly they were not named on headstones in the Nine Elms Military Cemetery, as they had not been identified. There are 97 unknown Canadian soldiers in the Nine Elms Military Cemetery. Of these 30 are identified by their unit affiliations, including 4 men of the 16th Battalion. That leaves 67 men of no known unit, of which 40 could easily have been the missing men of the 16th Battalion, Canadian Scottish. That was never mentioned in the video, in the fundraising campaign, or in any rebuttal of these findings in the past two years. If Private Fred Baguley was buried in CA40 as proposed, which we have no reason to doubt, it is most likely that he lies buried in the Nine Elms Military Cemetery as one of the unknown Canadian Soldiers. If not, we have identified where the CA40 site was most likely located, not a crater as shown in the TV show, but in a burial site south of Thelus some distance to the east. There is no doubt, the precise location of CA40 is a mystery, but we will find it in the near future and perhaps even find a means to confirm that Milton’s Fred Baguley is buried in Nine Elms or still lies in the real CA40 battlefield grave site.